شبكة ضد الإلحاد Anti Atheism | 2.5 new convert every second !! where are they ??? عرض المقال :2.5 new convert every second !! where are they ??? اسم المقال : 2.5 new convert every second !! where are they ??? 2.5 new convert every second!! where are they??? WASHINGTON: Former federal finance secretary MM Ahmad has said 41 million people have converted to "Ahmadiat" worldwide in just one year. The disclosure was made before Washington-based journalists, who were invited to Jamaat Ahmadia's annual convention in Maryland. This seemed like a new policy of "glasnost" by the otherwise secretive Jamaat. The 41 million figures, which is like nearly one-third of Pakistan, was naturally contested by the journalists. It seemed too big a jump from the previous year's claimed figure of 10 million. However, the Jamaat claimed they have proofs to back their claim. It is all do*****ented as each convert has to fill a form of acceptance and seek blessing (Baai't) from the Jamaat. Correction: There are few things worth noting about this news report. The figures given were not of the year 2001, but belonged to the figures reported in the Jalsa Salana of July 2000. For the information of readers, this years Annual Convention (Jalsa Salana) of Ahmadiyya, which used to be held in UK, was held in Germany, because of Foot and Mouth Disease. The figure announced in this Jalsa, according to the two emails above, was 81,006,731. Once again we see a gross discrepancy in the figures. And which figures is true? 41 million or 81 million? that Jamaat which was nearly 10 million at the onset of 4th Khilafat, has now exceeded 60 million. Who is lying? Why is this confusion? Did Mr Parwazi gave a wrong estimate? Of course he did not mention that this 60 million was in just one year, which means that he was mentioning the strength as it was in April 2001. But just two months later Mr M M Ahmad, incharge of US Jamaat announced 41 million new converts in just one year. Did he lie to the press? Or was he referring to the figure of year July 2000? And now the news came from Jalsa Salana of 81 million new converts in the last one year!! Were these Ahmadis from German Jalsa Salana fed lies, just to boost their moral? I do not think that Jamaat can deny that this figure was announced in that Jalsa. Which means that, as Mr Mushtaq Qadiani has boasted above in his post, every second 2.5 new people are converting to Ahmadiyyat. Where are they? I dare Mirza Tahir to just produce a list of 10,000 new white american converts in US (leave Pakistanis out of them) or in UK (the seat of Khilafat), or Germany or any other European country. Readers are reminded that since 1993 Jamaat has started a new system which is named Alamgir Baith (Worldwide Baith), as mentioned by former Ahmadi Professor Munawwer Malik of Physics in his article (Growing Number of Member in Jamaat Ahmadiyya 5 Million Baith in 1999 What are the Facts?). 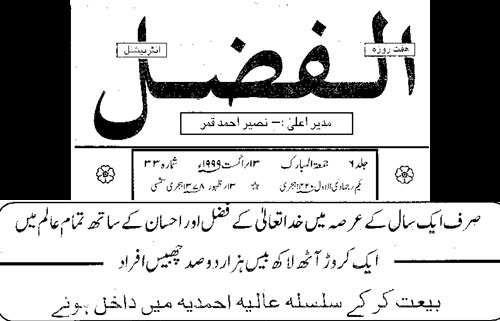 ......In just one year 10,820,226 persons all over the world took ba'aith and entered in Ahmadiyya Silsilah. From 1993 to 2000 according to the announcements there are about 63 million new Ahmadis. According to the current announcement of 2001, by an Ahmadi source mentioned above, the figure has jumped to 83 million (US figure) or 123 million (German) figure. Where are these Ahmadis? Did the old Ahmadis see their mosques filled with new-comers? Did they notice this change in the community centers? Where are they hiding? And where and when will this formula stop? If we continue to project the growth of Ahmadiyya by this doubling formula, then by the year 2010 or even earlier, there should be around 6 billion new Ahmadis worldwide in just one year. Suddenly the world population would double and treble, various world bodies like WHO, UN, UNESCO will have to announce an emergency, to cater to the needs of sudden doubling and trebling of the world population. Yet they would have to use a microscope to look for these increased numbers. It is hightime that Ahmadis should ask themselves as well as their leadership to account for these statements concerning the figures. Who is decieving whom? Murabbis are decieving Mirza Tahir? Or Tahir is decieving his stupid foloowers who will believe everything he says? Do they really!!! !